Ethiopian journalist Sekalem Fasil has been honored by the Global Forum of Freedom of Expression in Oslo, Norway. Serkalem was jailed in the aftermath of the highly contested 2005 elections in Ethiopia. Before May 2005, Serkalem and her husband, Eskinder Nega, used to run two independent newspapers, Menelik and Satenaw, both shut down as a result of the total muzzeling of the Free Press by the regime. Watch Video of the ceremony and read "To my brave sister Serkalem Fasil" by Yilma Bekele. For thousands of years, ethiopian merchants used a very sophisticated system of multiplication to calculate the price of goods on markets throughout the Horn of Africa and the Middle East. In a reportage entitled "A Night Of Numbers - Go Forth And Multiply ", BBC 4 reveals how ethiopians used a similar mathematical approach to multiplications as modern computers do these days by using powers of two and additions, what is commonly known as the binary numeral system representing numeric values using 0 and 1. Watch BBC's reportage on YouTube . Gellaw, the 2008-09 Yahoo! International Fellow at Stanford this year, is an example of how one person with a great idea can make a difference. Abebe is an Ethiopian journalist, but the regime in his home country is too repressive to allow true journalism, so he is in exile. 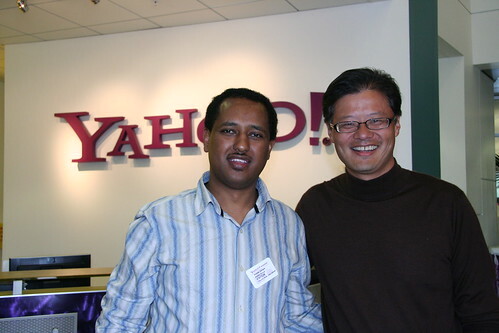 He had been in London for years before coming to the U.S. as the Yahoo! International Journalism Fellow at Stanford. Are web sites unblocked in Ethiopia?